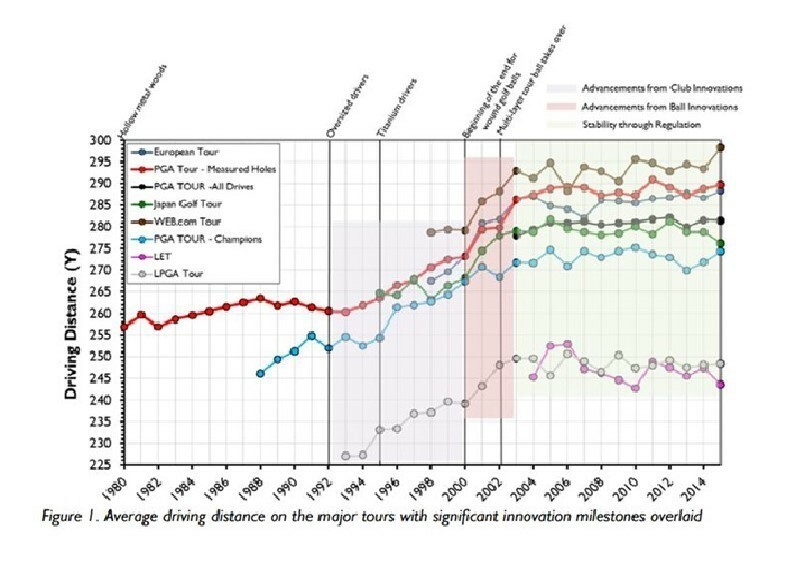 The USGA and the R&A recently released a study of driving distances on various professional tours. With the resources of both organizations, one would expect original data and insightful analyses. The reader will be disappointed on both counts. The data was supplied by the professional tours. It appears the USGA merely put the data in a spread sheet and produced charts like that shown in the Figure 1 below. Between 2003 and the end of the 2015 season, average driving distance on four of the seven tours increased about 1%, or 0.2 yards per year. For the same period, average driving distance on the other three tours decreased about 1%. This sounds like the USGA has curtailed the rapid increase of driving distance. Left unsaid—but shown in the charts—is the large increase in driving distance from 1980 to today. Average driving distance during this period increased from about 255 yards to approximately 290 yards (13.7%). While the charts do give a timeline of when club and ball innovations were introduced and when rules on equipment were implemented, there is no attempt to examine which were responsible for changes in distance. That is left to the interested reader. Future increases in distance will probably come from the change in the composition of players. Short hitters do not do well on the PGA Tour and are the most likely group to lose their playing status. When they do, they will be replaced by Web.Com players where the average driving distance is already greater than on the PGA Tour. The study could have tested for this “composition” effect, but it chose not to. Because of the increase in driving distances, courses have been stretched out. Does this give the long hitter an even greater advantage? Of the top ten money winners in 2015, six averaged over 300 yards. Three others (Fowler, Spieth, and Stenson), were above average in distance and capable of reaching many par 5’s in two. Only Zach Johnson was below average in driving distance. Is driving distance more important in determining relative performance than it has been in the past? Unfortunately, the USGA and R&A did not even attempt to assess the impact of driving distance on any aspect of the game. As regards to the Handicap System, the USGA has not changed its assumptions about the driving distances of the scratch and bogey golfer from 1994 to today. The scratch golfer has been frozen in time with an average tee shot of 250 yards. The bogey golfer is assumed to have an average tee shot of 200 yards regardless of what equipment he buys. If the standards by which Indexes are determined (Course Rating and Slope Rating) have remained the same, but an amateur’s driving distance has increased there should have been a resultant decrease in Indexes. There is no strong evidence supporting such a decrease. Nor has the USGA explained why its Course Rating System is impervious to changes in equipment. The USGA and R&A stated they will produce this distance report every year. If this means just adding another data point to the charts, then why bother?